There are a lot of needs to serve in the Phoenix area, and sometimes the full magnitude gets lost even on us. In order to better educate, we host tours every Wednesday at 3:30 p.m. and first Saturday of the month at 10:30 a.m. that meet at our main campus, at 420 W. Watkins Rd. Our parking lot is located at 2120 S. Third Drive. We'll walk through the campus and show you the nuts and bolts behind your favorite non-profit (or soon to be). If you're interested in touring another time, fill out the form below and we'll get back to you to schedule a date. Call 602.261.6841 if you have any questions. Located on our main campus are our food bank, kitchen, family dining room, clinic, urban farm and administrative offices. Ozanam Manor, our shelter for people over 50 or with disabilities, is across the street, at 320 W. Watkins Rd. 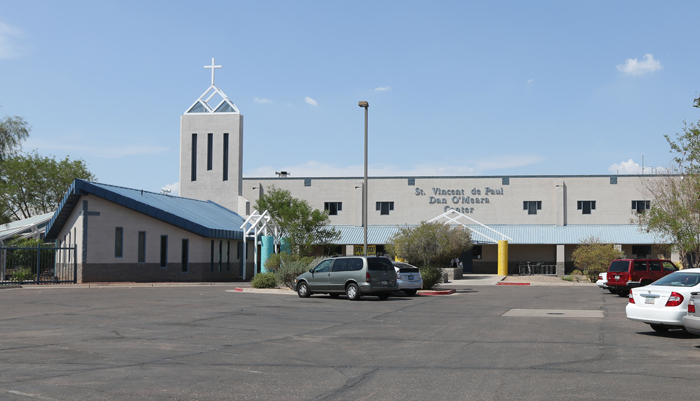 A St. Vincent de Paul Representative will be in contact to confirm a date and time, as well as find some information to better tailor the tour to your interests. Join the Society of One Million newsletter.